employing talented artisans who produced beautiful mosaics and frescos. He even adapted the Jewish mikveh (ritual bath) for use as a Roman-style bathhouse. the Temple was finished, nothing in the Roman world could equal it. The Temple building stood higher than fifteen stories and was made out of marble and gold. projects were built with what are known as “Herodianashlars”. simple plain and smooth rectangular block. This design is more difficult for the average visitor to identify. center of the block is called the boss. This ashlar has a smooth boss. Some ashlars had an uneven, or course, boss – as did many ashlars used in the Hasmonean construction. meter of stone ashlar would require about 120 hours of labor to cut and dress. of the Temple he said, “not one stone here will be left on another; every one will be thrown down” (Matthew 24:2). These stones remain from the very base of the Temple Mount wall. 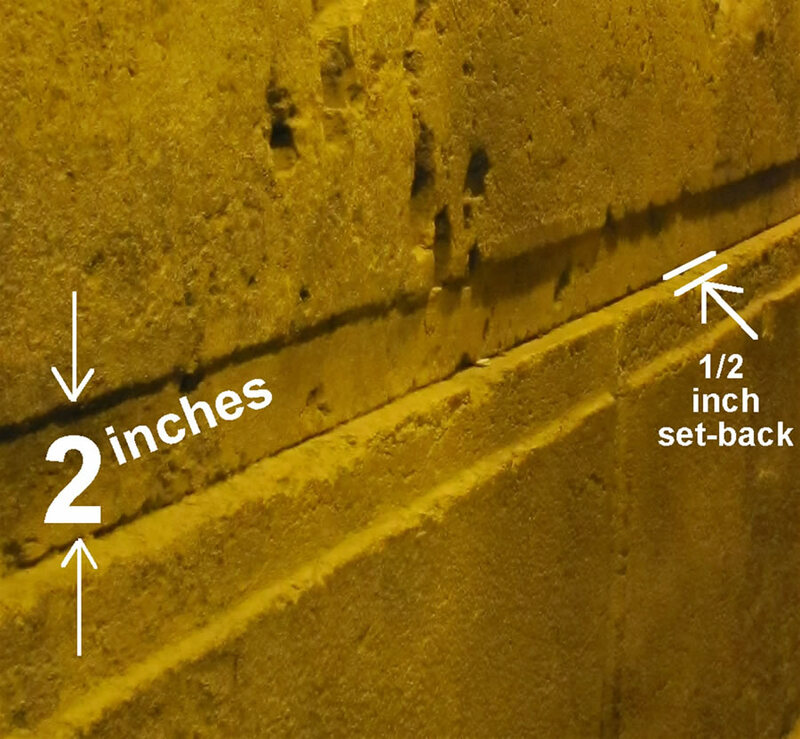 Notice that each course of ashlars was set back ½ inch to help stabilize the wall. They were not stacked evenly. Also notice the smooth-cut 2 inch margin around the edge of each ashlar. even after setting in the middle of all the wars and activities in Jerusalem for the past 2,000 years. 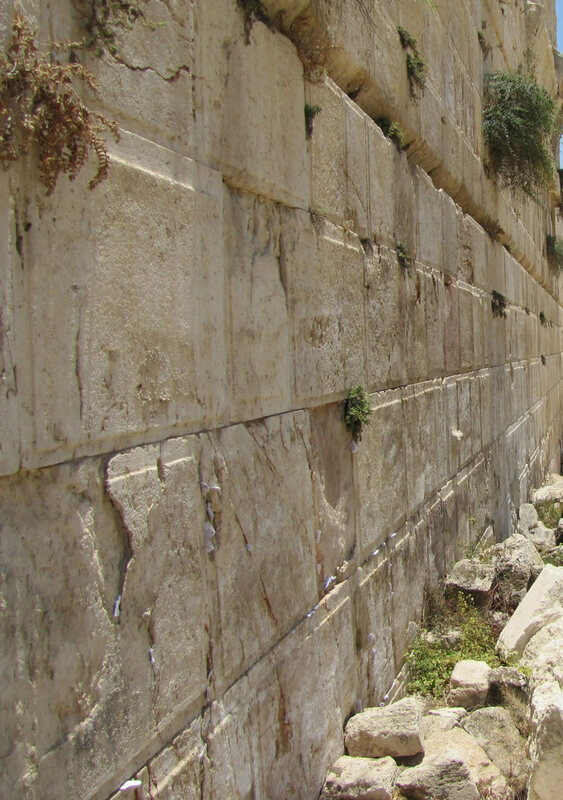 The margins, the raised bosses with the smooth face, and the tight joints in Herod's Temple Mount wall. 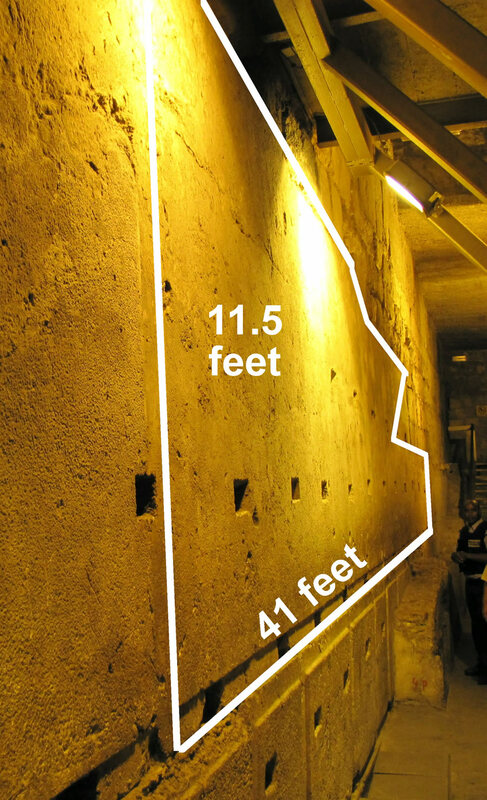 stones of the entire Temple Mount complex, measuring 39 feet 4 inches long by 7 feet 10 inches wide and 43 inches high. The large stone shown here is called the master course stone and weighs about 80 tons. All these stones form a strong corner as they alternate back and forth as headers and stretchers all the way up. The larger stones helped stabilize the smaller stones stacked below. pavement and steps continued along this south wall of the Temple Mount. They will be seen again at the Double and Triple Gates further down this wall. This Cornerstone is about 33 feet long, 7 feet wide and 3 feet tall. It weighs about 50 tons. Galyn Wiemers stands by the largest ashlar stone in the retaining wall of the Temple Mount. This ashlar stone is one of four stones that create what is called the Master Course. This stone is 41 feet long and weighs 570-630 tons. It is 15 feet wide and 11.5 high. The largest of the Master Course Stones here is 44 feet. One of four Master Course Stones set here in the Master Course to give stability to the wall. Smaller ashlar stones sit above and below the Master Course. This stone is 15 feet wide. 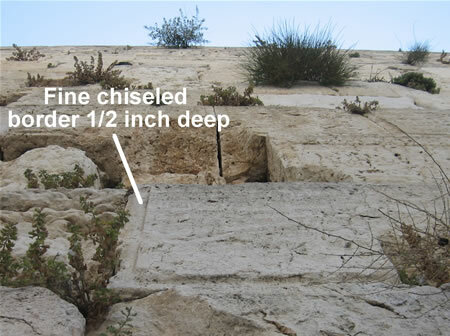 These ashlars along the southern wall of the Temple Mount between the Double Gate and the Triple Gate are twice the height of the other Herodian courses. These were a stabilizing band known as the great course. seen (about 6 feet instead of 3 feet). The Double Gate is to the left (west) of this photo and the Triple Gate is to the right (east). feet wide and 3.5 feet tall. As seen in this photo, the workers used what is called header and stretcher construction where the stones are laid west and south in an alternating pattern. Because of the great size of the stones and this style of interlocking construction, all the corners of Herod’s Temple have been preserved to a great height – the Romans were unable to move them. This southwest corner has been preserved to the height of twelve Herodian courses of original ashlars; eight are visible here and the other four courses can be seen in photos above. Notice the edge of Robinson’s Arch on the left side of the photo. Looking up at the Western Wall on the Western Wall prayer plaza. 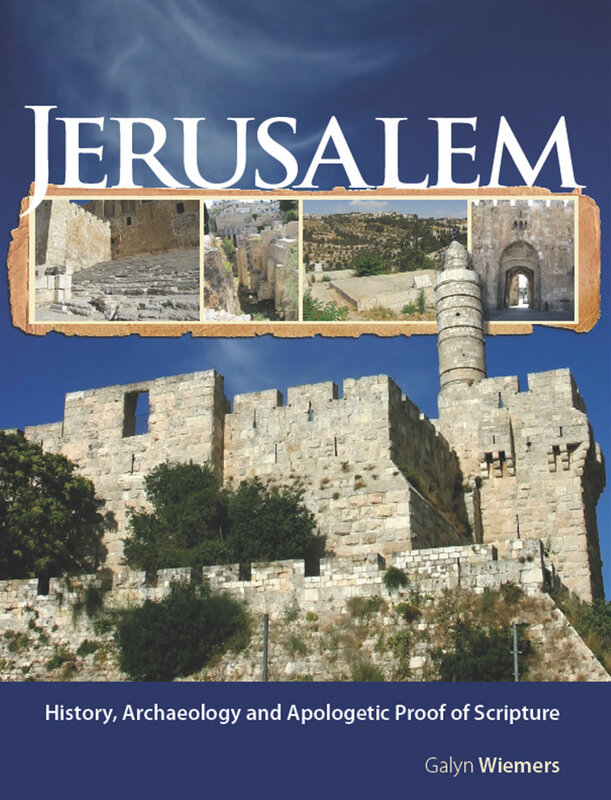 Four courses of original Herodian ashlars can be seen on the Western Wall of the Temple Mount. Ashlars were placed in rollers like this to be moved to location. This was one of several ways the stones were moved. Stones were also pulled by teams of oxen on rollers. An ashlar and its uncut projection on the south side of the wall on the southeast corner. Temple Mount can still be seen. The stone on the top is the Master Course Stone found in the Western Wall Tunnels. Notice again the 1/2 inch set back as each course is stacked on the other. We will see more later about this stone, possibly the largest stone in the Temple Mount wall. The rectangular notches were cut at a later time when this wall was used as part of an underground cistern. Plaster needed to be applied to the entire cistern in order to make it watertight. Holes were cut in the stones to keep the plaster attached, and long stones (as seen above) were placed in each hole. 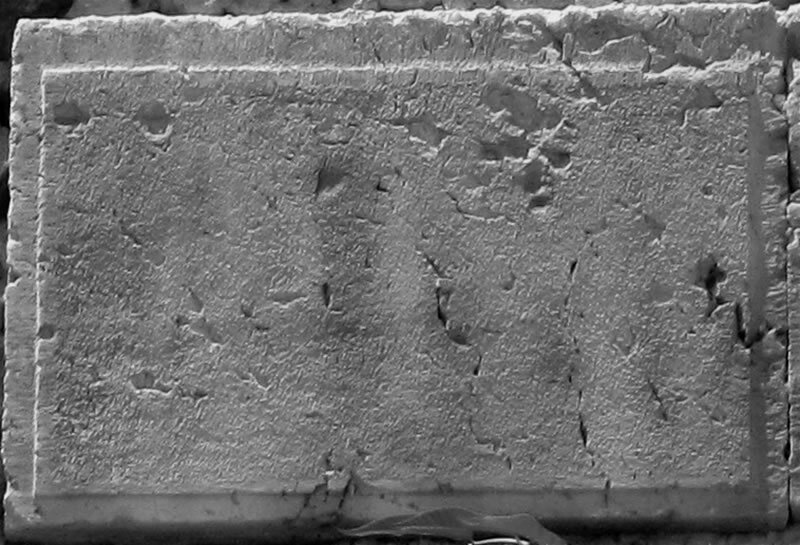 The plaster (also seen to the right above) was then applied to the wall. 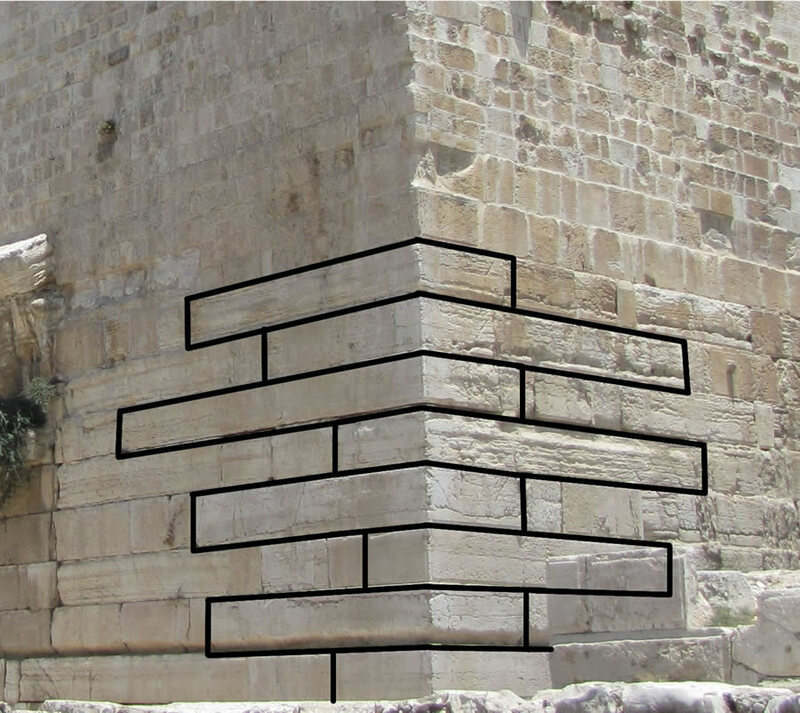 In this photo you can see the Herodian Ashlars, the rectangular holes, the long brick-shaped stone placed in the hole, and a very thick layer of plaster attached to the ashlars and strengthened by the stone connector.